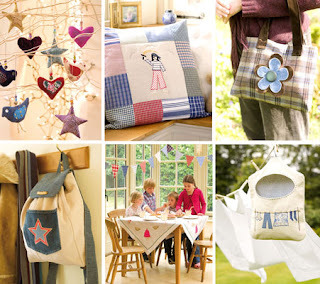 In November 2006 Alice and I exhibited as 'folkydokee handmade' at Country Living Magazines Christmas Fair at the Business Design Centre in Islington, London. We spent a fair bit of money on this show to achieve a warm friendly little shop like space with a counter made by the lovely Rod (my other half), a wooden style floor, a gold painted border a with Merry Christmas stencilled greeting and a mock up mantlepiece where we hung our handmade Christmas stockings. As many of you who do these kind of shows will know it is very hard to have space to store everything, put samples of all the product ranges on display and to also make the space welcoming and uncluttered and importantly fit us both on the stall (we come as a pair!) and allow space for folk to come in and browse. As a small company we could only ever afford a small space but the long thin ones always worked best for us as you get a lot of wall space to hang products and still have room for browsers to come in and have a closer look. We achieved what we had hoped for and i think it was all worth the extra time and money spent as we received lots of lovely comments about our little space. I feel it also was an important element in why we were approached at that show by the lovely Ali from the publishers David and Charles. This meeting was the start of an exciting collaboration for Alice and I which has now reached completion. Ali, who had been drawn to our stall and our recycled textile products asked us if we had ever considered writing a book. We had both toyed with this idea before having both had teaching backgrounds, but had never really pursued it.... (i secretly always thought i would write a self help book.. god knows i am an expert as i have read so many.. but that's another story). We arranged to meet to discuss the possibility of this after the Show. Creating the projects for the book was such fun and the process of writing the text a real creative challenge which we both loved. Alice and I have different styles so we were constantly editing what each other had written. The book contains beautiful illustrations which accompany our step by steps drawn by Helen Philipps and for the project photography we were so lucky to work with the wonderful Simon Whitmore. These photo shoots were tiring but great fun. The book was finished back in April and we received a copy in July.... this is me (photo taken by my 10 year old) with my copy... i could not stop jumping up and down i was so excited... i am on the phone to Alice sharing the excitement. in the side bar and following the search in book facility. To celebrate the launch of Sew Fabulous Fabric I wanted to run a little competition open to all bloggers as as thank you for all your support and comments over my last (almost 100) posts. Our publishers, David and Charles have kindly given me a few free copies of 'Sew Fabulous Fabric' so, these are up for grabs. You don't have to answer any questions to enter or live in the uk as we will post the book worldwide (please note that it is written in English), but what we would ask is that if you win you could write up a little review of the book and post it on your blog. Our books official publish date is 18th September, although i understand that it is now in stock, so i will do the draw on the 18th September at 9am. Good luck. This book is already on my wish list over at Amazon and has been since you first mentioned that you were awaiting its publication. It would be wonderful to win a copy and I would be delighted to write a review...keeping my fingers crossed. Your book is on my Amazon wish list too! I would love to win a copy of the book and would be happy to write a review of it on my blog. You must have been elated when approached by publishers. I know I would have been. I received a copy of my Pre-ordered book through Amazon, I have to say its fab, the instructions are so easy to follow and the pictures are very beautiful! I will get round to making something from it very soon. congratulations, the book looks fantastic, I'd be very happy to review it for you!! sHow exciting, you'll be able to lurk in bookshops and watch people looking at your lovely book!! Many many crongratulations Ginny, it looks so fabulous. What an amazing achievement! I'll be in the UK (including Farnham! )for Christmas and will definitely be buying my copy then - unless that is there's plans to publish in North America? Oh wow ... congratulations Ginny (and Alice!) That is so exciting. Your 'stall' area looked lovely - it was a major headache for my friend and I when we did craft sales - you never knew what sort of 'space' you were going to get! I am really looking forward to seeing what you have been up too!! I'm surprised if we don't see you in Sew Hip magazine next?? That is so utterly brilliant, well done you two ! Wonderful - great to see the photos of your stall again. Congrat's on the new book you must be really excited. wow! so exciting. well done ladies. count me in to win! how exciting is this - a book of your very own! i am so immensely proud of you both even though i have never met you - is that odd? The book looks lovely and I am excited at the thought os those beautiful projects. Please enter me in your draw. Well done, it looks lovely - I'm going to add it to my ever expanding Amazon wish list. Yey! At last! Well done to you both! Can't wait to see it. You must be so proud and screaming round the room with excitement! Will you be doing book signings! Tee Hee! I just have to say how wonderful it looks, and well deserved. I love your blog, and your book will build on its success. Good luck with it! I'd love the chance to win a copy, and would most certainly review it (and try everything out!). I got a copy of David & Charles latest publications catalogue just yesterday and opened it to see a photo of your gorgeous flower brooches inside the front cover. Well done to both of you !!! It must be a wonderful feeling knowing that all of your hard work has produced such wonderful results :o) Sarah x PS. don't forget to let me know your address so I can post off your freebie ticket to the SCCS next week !! Well done you two, you must be so proud of yourselves! 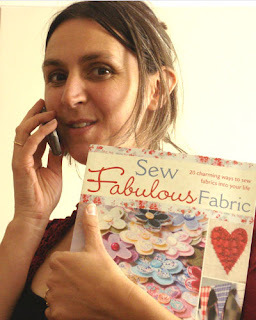 Good luck with the book launch, I'm sure it will be a great success and on many crafters Christmas wish list this year! I'd happily review it for you on the blog! the book looks great! I shall add it to my wishlist. you must be SO excited. It all looks beautiful. Please enter me for the draw! You are on my list of daily blogs to visit and I can only imagine that the book will be as great as the blog. Keep up the good work and I would love to have my name put in the draw. Wow, well done on the book.....I know how much hard work that kind of project takes. I hope it does swimmingly. Well, you learn something knew every day, I never knew you were behind Folkeedokee, I have admired your work for ages without knowing it was you iyswim...and congratulations to you and Alice on what looks to be a fabulous book...please enter me in the giveaway I would love love love to win a coy! What a big event in your life !! You must be so excited...i'll try to look it up at amazon. I very much like the idea behind this book. I pre-ordered your book on Amazon and I was thrilled when it arrived last Saturday in the post. It's beautiful and I can't wait to try a few things out. It must be so exciting for you both and to see how all your hard work was worth it. No wonder that he was drawn to your stall, it looked beautiful. The book looks fabulous and how unbearably exciting to hold it in your hands! I would love to be in your draw. It looks just my kind of thing. I am another purplecooer like exmoorjane and pipany and came to you via pipany. Congratulations on your book that's so exciting it looks brilliant I love the front cover If I don't win I think I will have to order a copy anyway I love your style! Well done! Ginny, so so happy for you. The book, of course looks amazing and I am just so thrilled for you. I mean let's be honest, not too many people have a book with their name on it :) I definitely would be thrilled to write a review and even if I don't win a book I am definitely getting one because I love the photo of the little bird mobile. A wonderful achievement Ginny and Alice.. I am full of admiration for your ability to juggle family and work so succesfully and with such charm and integrity!! Well done you.. I wish you all the success that you deserve from this fine publication!! I have been anxiously awaiting your book. I love to sew small projects with scraps(which I have a ton of). Also I buy fat quarters of fabric that I fancy and this will be the perfect book to utilize them! I am in the process of starting a blog and I would love to feature your book as my opening blog. Best wishes for all your endeavors and hope to be chatting soon. Congratulations! Your book is on my wishlist at Amazon! I'd love to be entered into the draw and would happily write a review! This must be so exciting for you both! Congratulations & I hope you sell millions of copies! How exciting that your book is about to be buyable. I have also had it on my wish list since you first told us about it. Good luck with sales (although if I was to win a copy it would be brill - guess I'd then just have to buy one for my wonderful like minded sister in law). Congratulations girls its a great achievement! Add me please! Your book looks fabulous. Hi thanks for the visit, you have a lovely blog and great news about your book! Please enter me. What a lovely book - and some delightful ideas (fingers are twitching already). Please include me in the draw and I would be delighted to write you a review on my blog. 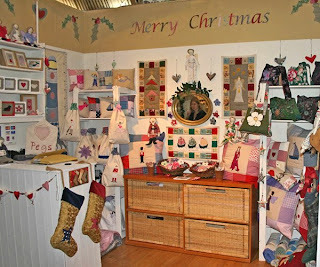 What a great result Ginny, your stall looked great. I'm a CL virgin this Christmas in Glasgow so any advice would be great - I cant help thinking there is something massive I've missed.